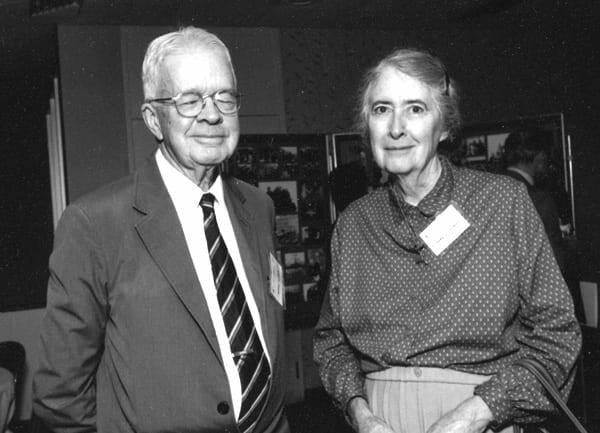 A generous gift by Elisabeth W. and Henry A. Morss, Jr. has allowed the Institution to establish a fund to support public colloquia on issues of global importance that confront the human race. Morss Colloquia will involve bringing one or more visitors from outside the Institution to lecture, conduct formal or informal seminars and discussions, and talk with Institution staff and students. Each colloquium is expected to include a public lecture and the preparation of an article for WHOI’s Oceanus Magazine. The fund is not intended simply to support guest lecturers: a substantial interaction with the Institution community is expected and relevance to problems of important societal impact is required. Colloquia are also expected to go beyond routine scientific meetings, to expose the Institution's staff and public community to new issues and new perspectives that cross disciplinary boundaries between the sciences and social sciences. Elisabeth and Henry A. Morss were dedicated to education and learning. Having long been interested in oceanography they became Associates of the Woods Hole Oceanographic Institution (WHOI) in the 1950s. Henry later served for sixteen years on the Board of Trustees and following that became an “Honorary Member of the Corporation". In 1959, Henry joined the Department of Geology and Geophysics at the Massachusetts Institute of Technology. During the years before his retirement in 1972, he worked as the liaison between M.I.T. and WHOI and helped to set up the Joint Program in graduate studies. They saw the goal of the Morss Colloquium not simply that of a visiting scholar lecturing to a defined audience. “It is to make a real effort toward assuring that scientists, students, and the whole community are exposed to the nature and magnitude of major problems of the planet and the human impact so widely felt. The Morss Colloquia is based on the recognition that such exposure must come from colloquia with knowledgeable individuals in an exchange designed to provide perspective and inspiration and be a contribution toward an environment where ideas flourish and are shared and insight into global interrelationships can grow."